No matter what your socio-economic situation, I believe your children need to learn the value of money. There is no universal formula for making your children financially literate, but I think three foundational principles are key. Children and work can be controversial. Images of child labor and sweatshops may flash through your mind, but not all work is an exploitation of children. I don’t consider mowing lawns, babysitting, or other household chores to be unfair child labor. By getting paid for work performed, kids learn that money must be earned. Few people in the world receive money without having to work, and your children shouldn’t come to expect it. Instead they should anticipate working hard for what they earn. 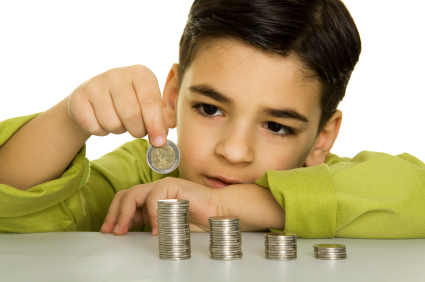 Your children should also use some of their own money to buy discretionary items. If you pay for everything, it’s hard for them to understand the need to make choices or for them to appreciate the value of their possessions. If they have to spend $100 of their own money on a pair of jeans, they might decide the $50 pair is good enough if they also get to buy a shirt or pair of shoes too. Children must also learn to save money. If you allow them to spend everything they earn, they may not grasp the principle of deferred gratification. Unless you’re going to support them forever, your kids will need to save money to buy a car, pay for college, or buy a home. It’s good to start the discipline of saving money early. I started doing chores and other work for my parents by age 8. I got paid $3 a week for by labor. My father also required that I save at least half of the money. My parents paid for all the necessities, but if I wanted a certain toys or something unusual, I had to use my own money. I didn’t fully appreciate it at the time, but my parents taught me the value of money from an early age, but I started to get a clue when I paid $4,800 cash for my first car (that was 1984). The principles I learned as a youngster have served me well to this day. You may not agree with my three components, but if you want to raise mature, self-sustaining adults, you better teach them the value of money when they are young. Next in The Value of Money – Part VI… Money: Good or Evil? Hi Bob, just wanted to send some words of encouragement. I’ve been reading and enjoying your blog. I too agree that your children should learn to be fiscally responsible, and now that I am older I understand the importance of the rules my parents taught me. I too had to save half of my money for college and expenditures and find its now easier that I am “in the habit of saving.” If it weren’t for those habits that were instilled early on, I am sure my husband and I would not have been able to purchase our second home at the age of 27. Keep up the good work, I look forward to your next post. The Budget Deal: And the Winners Are?